“The catastrophic problems we face today are speeding up the pace of evolution and calling forth the current expansion in human consciousness. With our world in crisis, our very survival depends on our ability to access higher sources of wisdom and guidance,” says author Colleen Mauro, former founder / chief editor of the magazine Intuition. The aim of Spiritual Telepathy is to help in that process. Written in a personal, easy-to-read style, it provides both theory and ancient techniques from the Ageless Wisdom Tradition linking mind and soul. Mauro makes a point to explain how the new science validates each of the many spiritual teachings she covers. Throughout the book, she shows that our culture's most celebrated creative thinkers—those we call geniuses or visionaries—all have had the ability to access the subtle world of the soul. And with inspiring stories of “ordinary people,” she also assures us that we can all gain access to the universal wellspring of creativity and inspiration. Mauro colors the book with her own experiences practicing these teachings, encouraging readers that they, too, can find success. Spiritual Telepathy is accessible for anyone just beginning an exploration of the higher mind, and it provides new theories and insight for those already well on their way. Spiritual Telepathy author Colleen Mauro has made some guided meditations that go along with the book available for free through her website. Spiritual Telepathy by Colleen Mauro has been featured in Conscious Lifestyle Magazine! Spiritual Telepathy Featured in Spirituality & Health Magazine! Spiritual Telepathy has been featured in Spirituality & Health magazine. Spirituality & Health Magazine Features Spiritual Telepathy! Spiritual Telepathy by Colleen Mauro is featured in an article written by Colleen in Spirituality & Health magazine. Spiritual Telepathy by Colleen Mauro has been reviewed by the Midwest Book Review. Spiritual Telepathy by Colleen Mauro has been reviewed in ForeWord Reviews. Spiritual Telepathy: Ancient Techniques to Access the Wisdom of Your Soul by Colleen Mauro is featured in Creations magazine. Colleen Mauro Featured on Cover of OM Times Magazine! Spiritual Telepathy author Colleen Mauro is featured on the cover of the September 2015 issue of OM Times magazine. Spiritual Telepathy by Colleen Mauro is featured in The Mindful Word. Spiritual Telepathy by Colleen Mauro is featured in the September 2015 issue of Common Ground magazine. 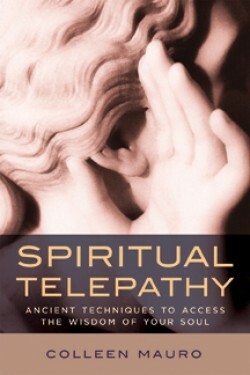 Alternative Perceptions magazine has reviewed Spiritual Telepathy by Colleen Mauro. Spiritual Telepathy author Colleen Mauro has an interview featured in New Spirit Journal. An exclusive excerpt of Spiritual Telepathy: Ancient Techniques to Access the Wisdom of Your Soul by Colleen Mauro can now be read on Reality Sandwich. Spiritual Telepathy by Colleen Mauro has been excerpted in the Summer 2015 issue of New Consciousness Review. Spiritual Telepathy by Colleen Mauro has been reviewed by Cynthia Sue Larson in her e-zine Reality Shifters. Spiritual Telepathy by Colleen Mauro has been featured in The Edge magazine. Conscious Inquiry Interview with Colleen Mauro Now Available! Spiritual Telepathy author Colleen Mauro's recent interview with Alexis Brooks on the Conscious Inquiry radio show is available now. Spiritual Telepathy author Colleen Mauro will be interviewed by Dr. Susan Kolb on the Temple of Health Radio Show on Saturday, April 18 at noon Eastern.